They simply will not be able to believe their eyes when this massive gift basket arrives at their door. 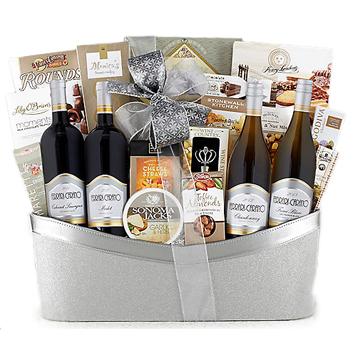 Our gift experts have gone above and beyond to create a mountain of treats that's sure to please including a bottle each of Fine Cabernet Sauvignon, Chardonnay, Pinot Grigio, and Merlot partnered with Garlic & Herb Crackers, an assortment of Cookies, gourmet Olives, Cheese Straws, French Truffles, and much more! Top off the family feast or show that VIP how much they mean to you with the Ultimate Holiday Basket. Please note: basket shape & design and exact products selection may vary based on local availability at delivery location. Due to trade sanctions that are beyond our control, some imported food items may be substituted with local variants of equal or greater value.